Last year, I was asked to be in charge of desserts for a renegade Seder. Such is the path by which I discovered Matzo Toffee, which is what baby matzo hopes it will grow up to be someday and what you, once you make it, will be unable to stop eating. Don’t say I didn’t warn you. You don’t have to be Jewish to appreciate the combination of all good flavors—the richness of bittersweet chocolate, the butteriness of toffee, the earthy snap of almonds, the crunch of matzo, & the edge and texture of quality sea salt—but if you are Jewish and observing Passover next week*, it might be exciting to discover that matzo can actually be delicious. What is a renegade Seder, you might ask? Well, consider that our hostess was a Jewess whose Twitter bio claims she is a “kosher pork authority.” Her sweetheart is a Muslim and for Halloween, they dressed up as the Israeli-Palestinian conflict (she taped settlements to his shirt as the night wore on). For the reading of the Haggadah, we had gift bags full of “plagues” represented by various craft-store-acquisitions, including red foam cut-out boils. There were Red Sea cocktails with drowned Egyptian ninja figurines. (Please note: we love Egyptians. We do not wish them any violence. We were just going along with the Bible story). And I, the Hindu, was unable to eat the desserts I had made for the Seder because I had given up desserts for Lent. Heh. But the toffee went over so well with the rest of the evening’s guests that they convinced me to save a bag for Easter Sunday, upon which occasion I promptly devoured what was left. Before we dash off on vacation, I’ll be making up a batch of this good stuff in solidarity with my Jewish friends and students. Now that I’m back from the 8th grade Washington, D.C. trip—a whirlwind, exhausting and unbelievably fun four days—I’m relishing the spring break life but already kinda miss my students. Just don’t tell them that! *To make this recipe kosher-for-Passover, ensure that all the ingredients are certified kosher-for-Passover and that the kitchen you’re cooking in and utensils you’re cooking with are as well. Since this recipe contains a large amount of butter, serve it with a meatless meal or make it with kosher margarine. You may need to omit the vanilla. You can also make this recipe with Saltines or another plain cracker, omitting the sea salt. You might want to double the recipe, while you’re at it—it’s incredibly simple to make and very, very satisfying. pan: Baking sheet(s) lined very well with foil, then top the foil with parchment paper. Yes, this is necessary. Toffee is messy business, you know. Delicious, but messy. Place the matzo along the bottom of the baking pan, breaking it up to cover the whole bottom. In a big, thick saucepan, melt the butter and brown sugar together over medium heat. Bring up to a boil, stirring regularly, for about three minutes, as the mixture thickens. Remove from heat and stir in the salt & vanilla. Pour over the matzo, distributing the caramel mixture evenly and quickly. Move the baking sheet(s) to the oven and bake for 12-15 minutes, watching to make sure that the caramel doesn’t burn. (If it begins to get too dark, remove from the oven & turn down the heat to 325˚.) Once everything is nice and golden brown, remove from the oven and immediately sprinkle the matzo with the chocolate. Wait a few minutes, then smooth out the now-melted chocolate with a spatula. See how you just made the recipe work for you? Love that. As the chocolate is cooling, sprinkle with the toppings of your choice—in my case, some almonds & good sea salt. 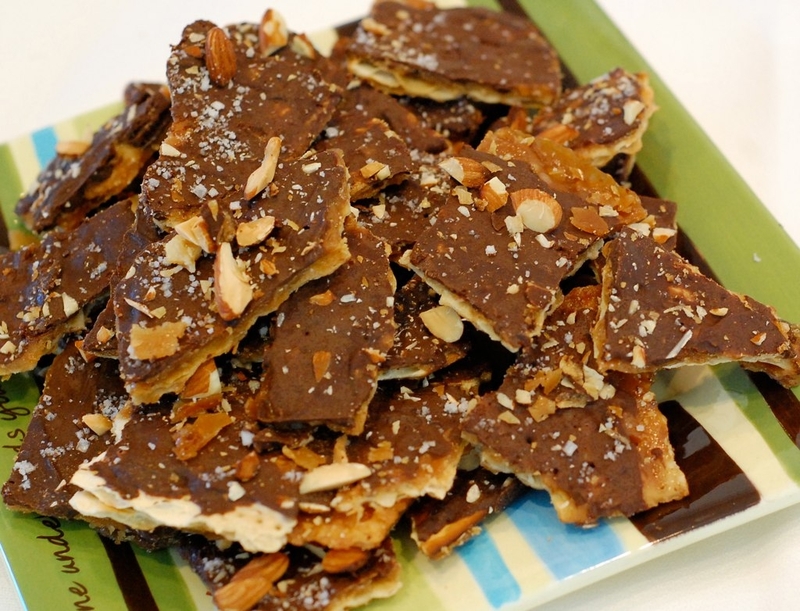 Let the matzo toffee cool completely before breaking into pieces and devouring it. If there’s any leftover, it will keep in an airtight container for up to a week. Oh wow. That sounds **amazing**!! I think I would even like to eat that for breakfast, lol. We always have an overstock of matzoh around this time and you can only make so many “pizzas” with them. This looks simple enough for even me! Thanks for sharing. Can’t wait to hear about your vacation! Thank you so much for posting this! I’m an atrocious cook but I will attempt to make this. Wonderful! Happy Easter in advance! I am on my way to the store now to get these ingredients. You’ve made it seem possible, even for me. This looks great! We use to make something similar with saltines but I truly think I would prefer this version more.